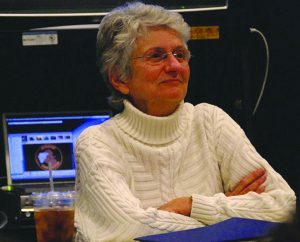 During the rehearsal process for A Shayna Maidel, dramaturg Deborah Blumenthal spoke with playwright Barbara Lebow about her process creating the play and its resonance in today’s world. Learn more about the powerful play in her exclusive interview. It came in little pieces, and I didn’t know what it was fully until after [the idea] had been around for a while. I was daydreaming, and suddenly in my mind— this was a few years before I wrote the play—I saw these three people. They were an older man and his two daughters. I didn’t know their names or anything about them, but I saw them and I couldn’t get rid of them. I wondered who they were. With a lot of my writing before and since, I would see a lot of images [in my mind], and I know if I keep thinking about [something] I have to pursue it and find out what it is. They hung around a lot in my head, and when something keeps coming back, I know I have to pay attention to it. I knew I did not want it to be a Holocaust play, or to think of it that way—although yes, it is, but I knew that was the background of it. I was determined not to have concentration camps in it, and for it not to be about that. I always write about survival. Maybe any play anyone ever wrote is about survival. Even as child, I loved desert island shipwreck survival stories. And I always know, with everything I write, the end of the play. It has to do with the way the audience reacts to the ending. I figure out what got me emotional about an event or history or a moment in time, and that’s the way I want the audience to feel at the end. So then I go backwards. I knew what Rose was going to say [at the end], and then I went backwards in terms of structuring and actually starting to write. I knew there would be fantasies and memories, and I backed way up and worked toward that [final] moment. Was it inspired at all by people in your own family? My grandfather, who was not Mordechai, his story was different—there was no Holocaust story involved—was an old-world patriarch from Romania. He started out, to save a nickel on the subway, pushing his pushcart over the Brooklyn Bridge into Manhattan, and setting up a stand which wound up becoming a very small but successful handkerchief and scarf business. He was wonderful to me, but I heard many stories about how tough he was on his children. And his personality informed Mordechai a great deal. But I knew I didn’t want [the play] to be about the family story that I had. I wasn’t interested in writing that story because I knew it. Rose was not the essence of me personally—I wasn’t her age [when the play takes place, I was a kid]—but she is between me and my mother in time, and that was another part of what interested me as I was finding out who [these characters] might be. I think that [feeling] must’ve been in me from the time I became aware that I was lucky to have been born in this country. [The war] was a large part of my childhood, that way—feeling lucky, like I got away with something. None of the family I knew had been survivors [of the Holocaust]—they came [to the United States] the previous generation—but I saw that Lusia in some way had to represent what might have been. [One woman] said, “People tell me how wonderful I am to be a survivor. I don’t know. All I did was live.” She wasn’t being modest. She was being genuine. What kind of research did you do when you were writing the script? I spent a couple of years speaking to people to and reading and thinking and waiting for the characters to show me who they were, doing research of the times and places. [When] interviewing survivors, I always began by asking them, “What happened the moment you were freed, the gates were opened, and you could leave?” and all of them wanted to tell me what happened before. Of the various people—almost all women—with whom I spoke, I encountered, to my surprise, a sense of humor. I don’t mean jokes, but kind of a wry sense of humor, which I think must be essential to any kind of survival. I think that’s one of the things that keeps people going, somehow. Almost every one [of the women] said that they had either a sister or a close friend who was like a sister [who] helped them survive. They wanted to help feed them. They wanted to share their bread with that person because they wanted that person to live. [One woman] said, “People tell me how wonderful I am to be a survivor. I don’t know. All I did was live.” She wasn’t being modest. She was being genuine. She was very innocent, the way she said it. Other people would say they wondered why they lived and other people didn’t. [Another woman] emigrated afterwards to Australia and her sister to New York. A lot of her story—not her exact story, her emotional story—found its way [into the play.] I wanted these stories to be in [the play] as a totality. Can you talk about your decision to have some of the dialogue be in Yiddish? [The characters] are speaking their natural language. The way things are translated where Yiddish slides into English and it repeats what was said in Yiddish without repeating it exactly was [also something] I wanted because that’s the way my grandfather spoke, and the way some of the people I interviewed spoke. I wanted that flavor there. [Yiddish is] what I heard in my childhood. My mother spoke only English to me unless she was telling a joke that had to have a Yiddish punchline. She was very modern New York, but when she [spoke] to her father, she would call him Papa, and speak to him in Yiddish. So that kind of thing came into my ear. I don’t speak any Yiddish. I could understand some because my parents would speak it if they didn’t want me to understand. My grandmother only spoke Yiddish to me—she only spoke Yiddish as far as I know. I never spoke it, but I always understood her. I like to say she spoke love. This play is about 30 years old, but it seems to be more and more pertinent to things going on in this country every day. What do you hope people take away from watching your play today? This has been on my mind! When the play was done at Hartford Stage, I got a letter, from a woman saying she worked with Cambodian refugees at the time, and what she wrote was maybe the best thing, that made me the happiest of anything I’ve ever read about this play, and is exactly the answer to your question. She said that seeing the play made her understand what they were going through: the trouble with the language, the difference with the culture, all of that. When I was writing the play, I didn’t think it was about this, but I [do] think it’s relevant because [in the play] there are both sides of the lives of immigrants. I couldn’t foresee it, but I recognize now some of the same—I hate to use this word because of its current context but—walls they have to climb, the walls that are put up from people who have lived here, either hidden or legal. And of course there were people before that, treated like that—maybe at least one wave of people per generation that were shunned in some way with some of the same words we’re hearing now.